DILKON, Navajo Nation -- Ofelia Rivas, Tohono O'odham, and Earl Tulley, Dine', discuss the cultural lifeways and spiritual foundations of their people, during the Dine' CARE Western Peoples Convention. Ofelia begins by describing the vast lands that were Tohono O'odham ancestral lands in what is now Arizona and Sonora, Mexico. "Our lands are very vast," Ofelia said during the conversation with Earl Tulley, Dine' of Blue Gap, on Spirit Resistance Radio. Ancestral Tohono O'odham lands spanned from Hermosillo, hundreds of miles south of the current border, and north to Phoenix, and east to Benson, to the San Pedro River, and all the way to the Sea of Cortez in Sonora, Mexico, she said. The plant life -- medicine plant life and food plant life -- and deer and animal life sustained the people. "Our Creation stories state that we were there in the beginning, to witness the formation of our Sacred Mountains." "The beginning of our Sacred Mountains is the beginning of who we are." O'odham culture is based on the rains that bring the desert water, she said. "The most sacred songs and ceremonies recognize the sea, and where the clouds are formed and come across the land, to bring rain for planting time, and to replenish our foods, on the land." Ofelia said she was raised in the traditional O'odham way, where women sat on the side and did not say anything. But early on in her life she was recognized by the Ceremonial Leaders for her role. "It begins in prayer," she said of the Ceremonial cycle, and shared how young men continue in the Ceremonial way. When the saguaro ripens, in late June or early July, that is the beginning of O'odham new year. Ofelia said her resistance is to speak her language and continue the O'odham way of life. Ofelia encourages others, like her, to survive boarding school and sustain life with the traditional ways. Earl Tulley asked Ofelia about greeting others when they come to her land. "We are still here," Earl says, of the greeting in Dine' of Yah-ta-hey. Ofelia said the traditional way is to make it known you are present, and the person in the household gives water or food. Earl says young Dine' who don't speak the language, often use hand signals, or a nod, as a way of communicating and showing respect to elders who speak only Dine'. Earl said before the days of the Treaty, Dine' lived under the natural laws, with an understanding of the moon, and the sun. Ofelia said O'odham never separated life and the natural world into words like "environment." The mesquite wood was collected at a certain time, and the poles would last longer this way. This was a way of life. "The women had their own roles, and they were very powerful," she said. Ofelia said O'odham for thousands of years have collected salt from the sea. "You need to know the songs to collect this medicine called salt." When salt is not collected in the right way, it causes imbalance. She said when people are not connected to the natural laws, it causes imbalance. "We're hoping that the Seventh Generation will learn from what we have learned growing up," Ofelia said. There is a great deal of disrespect because people do not speak and understand O'odham. Ofelia said of her people, "I am from the people, Stars Coming Out." Today, young people are disconnected, and there are mispronunciations, even on the radio. She used the example of "corn coming up," and how the elders said a slight mispronunciation can be disrespectful. Ofelia speaks of respecting the mountains, and land, and the people who have been present there before, when one steps on to land. Earl said growing up as a child in the traditional way is a way of life, like offering the corn pollen in the early morning. Earl discusses the way education is viewed in today's times, and how today's society calls mimicking information "education," which is often referred to as "becoming learned." But in the traditional way, education takes on a different meaning, which includes understandings, including which family member speaks forth. "Earth Maker gives us our talents," Earl said. Speaking on modern education, Ofelia said her nephew said his paper degree was worthless when the San Juan River was contaminated by a gold mine, because he could not stop the contamination. Ofelia recalls listening to the elders, and following the moon, and the natural world. Today, Ofelia said O'odham are forced to speak English in order to talk with others. The Original Peoples of the Land are connected to the universe, and the Songs and Prayers are carried out for regeneration every year, she said. Earl describes how some who went to schools like Carlisle were trained in skills, like making shoes. But when they returned to Navajoland, people were wearing moccasins and not shoes. "They ran away because of this," he said, because their skills didn't fit at home anymore. Recalling O'odham elders words, Ofelia said, "When the wind blows, we need to bend so we don't break." Ofelia said the tribal government has been bureaucratic and has not encouraged young people to go out and get an education and return to O'odham land with what they have learned. O'odham young people have gone out and received an education, and need to be encouraged to come back, including those who are educated in the management of money. Ofelia said she stepped back from the border work for five years, and waited for young people to come forward with solutions, but no one came forward with solutions to the abuse by the U.S. Border Patrol agents, which continues. She described working with youths. They plant seeds and water the seeds, then watch and protect the plants as they grow. This basic knowledge can be used in any level, she said. Young people need their education. Earl said we live in a world where we can eat foods out of season, but it is not the same. Earl said respect needs to be remembered, such as giving up a seat for an elderly, or allowing them to go first in the line for food. Earl said the knowledge is not for people to keep, but to be shared. Speaking of problems today, Ofelia said one of the problems today is dis-enrollment, as was the case with an O'odham family related to gang members. Earl said many Dine' have children and grandchildren and are combined with other peoples. Ofelia says in Ceremony, however, it is inclusive, there is no color, no race. "It makes us more rich," Ofelia said of O'odham who are O'odham and other tribes. Ofelia said if you know who your grandmother is, there is no disconnection. Earl said through history that there was no school, no one, that could take away the original language. "We are doing it to ourselves." Earl said in boarding school, they were forced to say the Pledge of Allegiance every morning. But they would say the Dine' word for "the sheep are coming," instead of the word "America." Earl said Dine' prayers call for the blessing of the Five Fingered Ones, all people. "We are all one people," Ofelia said. "Wherever we go, we must remember, We are all one people, and we all have our ways." Speaking out against domestic violence, Earl said, "If we are true warriors, we have to understand our particular role that life is sacred." "That is when Earth Maker is going to be very proud of us," Earl said. Ofelia said the chemicals in foods, and drugs, must be removed. Earl said the Two Spirited Ones have different views and must be respected. Today, the Two Spirited Ones are not fully accepted. "All life if sacred," Ofelia said. Copyright Ofelia Rivas, Earl Tulley and Censored News. No portion of this article may be used without permission, or to generate revenues. 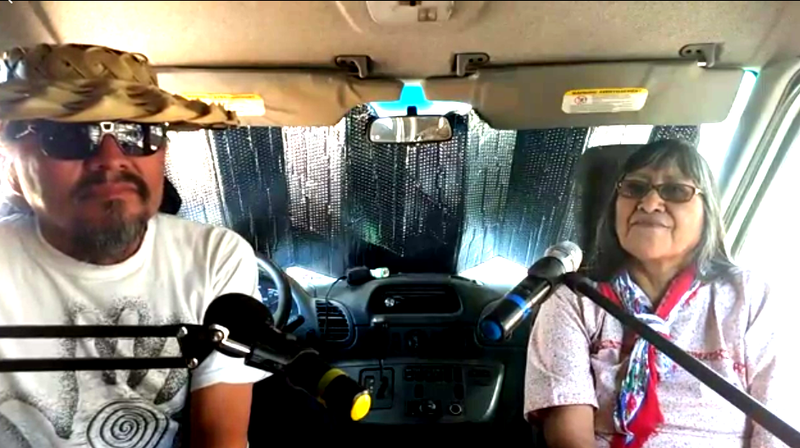 Watch video interview by Govinda Dalton, Spirit Resistance Radio, life from Dine' CARE at Dilkon on the Navajo Nation. Video copyright Spirit Resistance Radio. Click arrow to watch.